True Bride is a forward thinking bridal dress design company which focuses on using high quality fabrics to create beautifully cut wedding gowns, together with decadent beading and detailing to really give brides that wow factor. 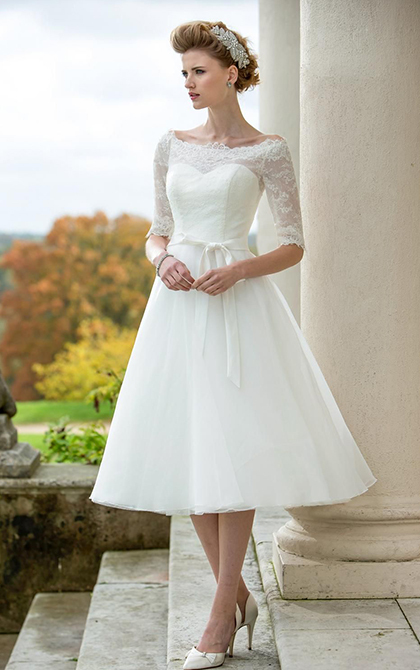 We also currently stock the popular Brighton Belle range, brought to you by True Bride, which is aimed at brides looking for a retro feel to their gown. With on trend tea length dresses and stunning beading and lace work, these sassy dresses will be turning heads all over the UK! To book an appointment or find out more about our True Bride & Brighton Belle wedding dress collection, give our team a call on 01384 291600 or use the Book Now button.